Witty, thoughtful, energetic acoustic folk music with just a bit of attitude. 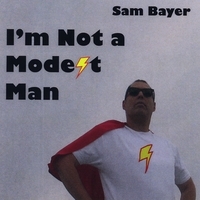 Boston musician Sam Bayer is your literate, exuberant guide to an imaginary world where housewives win the Nobel Prize in physics, poker-playing children gamble over their bedtimes, and metaphorical elephants pirouette in the den, four and a half minutes at a time. His latest CD, I\'m Not a Modest Man, features songs like Your Side of the Bed - a love song that recapitulates the history of colonialism - and the all-too-accurate title track. Sam is joined by percussionist David Troen-Krasnow, playing cabasa, triangle, and just about everything in between.